Disclaimer: Received the pattern for free. Opinions my own. Dragons were not harmed in the making of this dress. My blog has a contact form and occasionally I get contacted by companies for weird promotional purposes. It’s pretty rare that happens and I usually actually ignore the emails. I know, terrible, but sometimes they have nothing at all to do with sewing so why would I even bother wasting my spoons on people that are clearly spamming anyone with a blog? I’ve been contacted about posting promo for men’s fashion, women’s fashion, ray bans, etc. 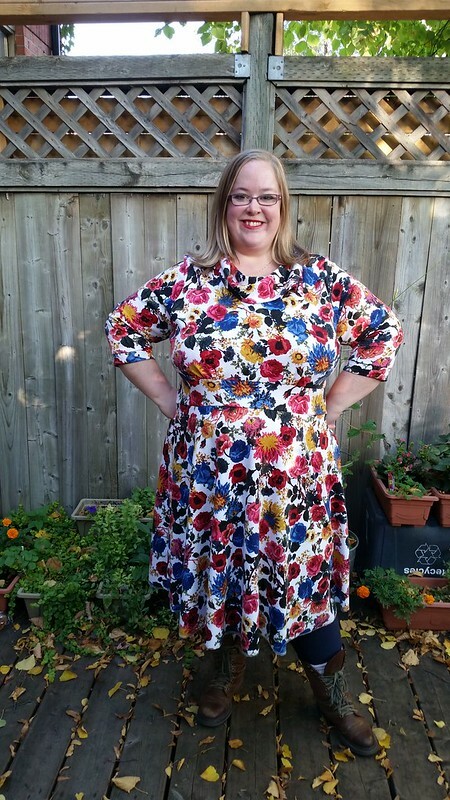 Recently, Rebecca, the creator/owner of Moxie patterns, contacted me for a pattern testing opportunity about her increased size range for the Verity dress plus a new collar. I generally leap at free stuff and decided to go for this. I will say, though, I’m probably not going to leap at future pattern testing unless it is from Cashmerette or Muse Patterns. I’ve had a lot of spoons go toward it lately and I really need to focus on an accessible wardrobe instead of the next new and shiny new pattern. Of course, I am a magpie and generally have trouble saying no to the next new and shiny. If I go back on that, please remember I am a weak human creature. 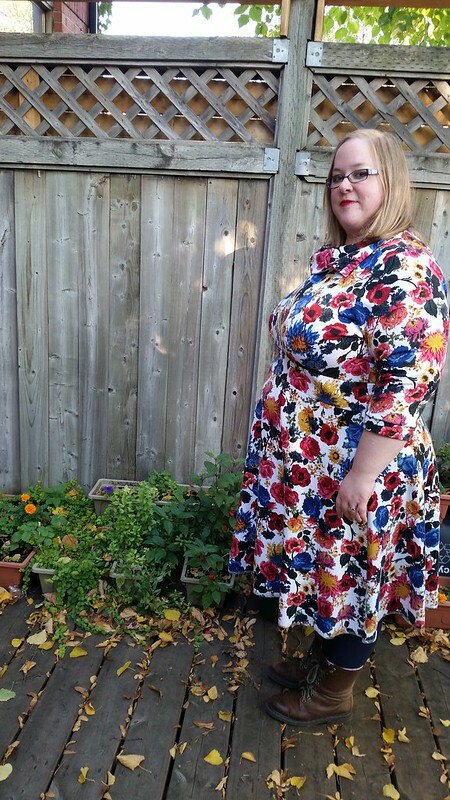 The Verity pattern grabbed me because it reminded me of my favourite ModCloth pattern, the Coach Tour dress (fyi, none of these are affiliate links…I’m not making money from my blog at all). Back in the day, when I was buying clothes instead of making everything, the Coach Tour dress was my favourite ModCloth dress. 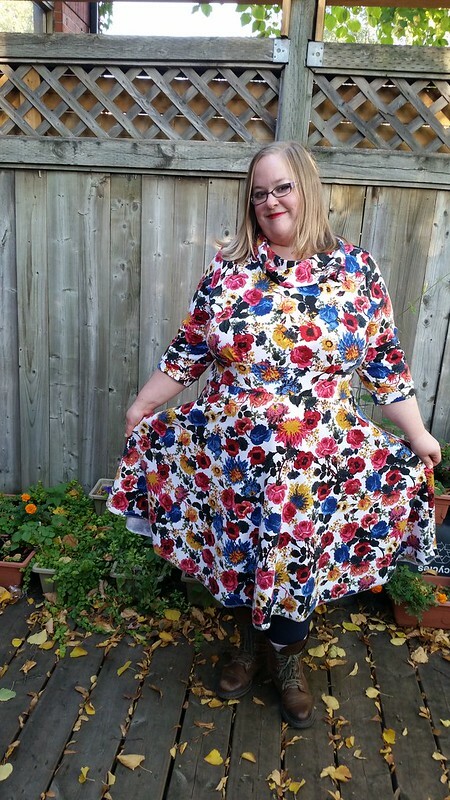 I got a similar looking dress from eShakti later on, because the $60 US price tag was a big rich for my blood. 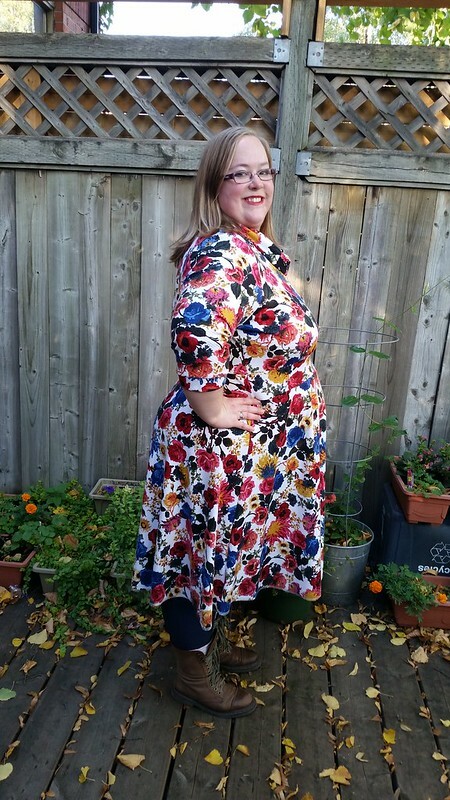 eShakti dress was purchased on sale during a buy one get 2 free sale so it was afforadable. I also added sleeves to it. I still wear it to this day because it’s a gorgeous red. But every time I wear it, people ask me if I made it and I have to say no… I would buy ModCloth on sale and then take a hit with customs prices. 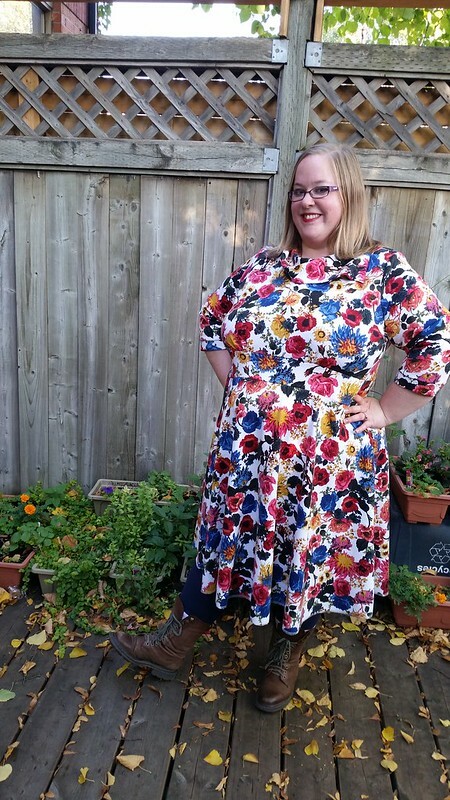 I also loved the Windy City dress and actually had it in a bunch of colours and styles (okay…three). So if someone out there could make a knock off pattern for that or recommend one for 51 inch bust…that’d be great! Back to the Verity dress. I had trouble saying “No, I can’t test this as I really need to make new bras and a swimsuit and costumes for the end of October and a crib set for a friend…” So I didn’t… I said YES and made grabby hands motions. I found this lovely soft cotton/rayon knit at a local store. It’s medium weight with a quilting texture and is super soft. It was a bit more that I was looking to spend for a pattern test, but it was definitely the right choice for the dress. Rebecca has really made the instructions for the pattern great for beginners. A person of any level can sew this dress with all the detail in the instructions. She also includes alternative options and ways of constructing the dress so that if one way seems too complicated for a beginner, they can try another way. Or if you prefer one method over the other, it helps to see the two methods there. For experienced sewers, there are shorter instructions in the style of say…Burda or StyleArc where it tells you sew up side seams instead of taking you through how with pictures. Of course, all these details make for an incredibly long instruction booklet. I would recommend viewing it digitally if you want to save paper. The pdf pattern is 60 pages as well as the 42 page instruction booklet. That’s a lot of paper! The pattern includes three different sleeve lengths, as well as sleeveless options, shirt versions and a dress version. The sleeves are puffed and have bands. You can also make it with various neckline options: band, cowl, split cowl like the ModCloth dress, and the new peter pan collar version. There is gathering under the bust, a waistband, gathering at center back, and a circle skirt. For my test version, I chose to make the dress with elbow length sleeves and a split cowl neckline. 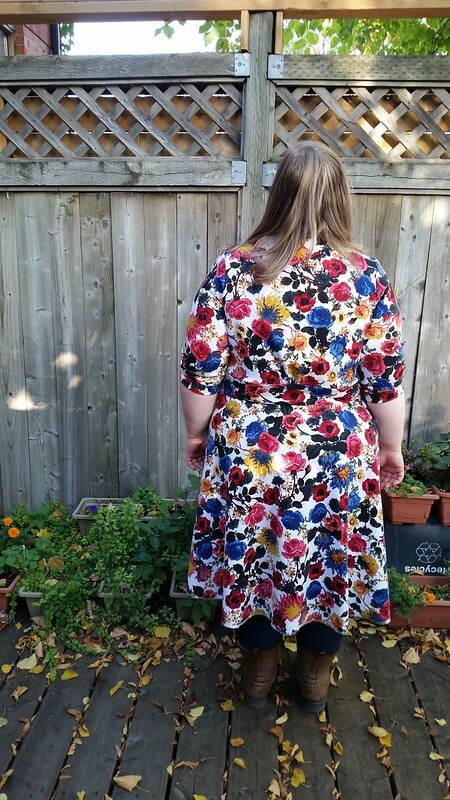 You will notice in the pictures that the sleeves are not puff sleeves or elbow length (in the picture of my back, the sleeves are bunched up slightly to the elbow; they are readjusted for other pictures). The issue with puffed sleeves has been resolved in the final pattern, I am told, as well Rebecca said that she was going to deal with the length of the sleeves/skirt. I am also 5’4″ so on the short side with tyrannosaurus arms so take that into consideration. This is something I told Rebecca to take into consideration for the length. The pattern is drafted with a 5’6″ height in mind. I really enjoyed making the dress. I made it in one evening including cutting using my serger for the most part. I used my machine for stitching the collar with a lightening bolt stitch. I just serged the hem. I originally was going to do a proper hem, but the fabric isn’t flipping and the hem looks pretty good as is so I’ve decided to leave it as is. In terms of fit, it’s pretty good. I actually am between a 5X and a 6X in this pattern. The extended sizes go up to 8X or a 57.5 inch bust. I settled on making a 6X. Looking at the fit of this, I’d definitely size down next time since I have no negative ease in the bust and have a bit of positive ease in certain places. I was very impressed with how the shoulder fit on the dress. I didn’t need to narrow the shoulder at all!!! I usually narrow the shoulder by about 1-2 inches on any pattern I use. The only adjustment I made was to cut the length for 3X instead of 6X, because I was pretty sure I would need to shorten it. Even with that, it ended up longer than the above the knee length of the pattern photos, but, like I said, that is something that was adjusted for the final pattern. As I have stated in the past, I don’t do a star-rating system for test patterns, but when I make the pattern again, because I will make it again using the final released pattern, I will give it a star rating at that point. I have a brilliant idea of making it out of some gorgeous two-tone stretch velvet for a classy winter dress. There is some locally that I might splurge on for my birthday next month! Anyone else get Western vibes from my dress? 😀 Do-si-do! The increased size range with the peter pan collar is available in the Moxie Patterns Etsy store along with the straight size version or through Creative Notions, Rebecca’s blog. Oh! I love it! The cut is really great and I like the collar. I will have to give this a try! Dress suits you, you both look great 🙂 This is the second time I’ve been about to drop you a line because I’ve missed you and you’ve got in first with a post – glad your ok. Thanks so much, Lucy! I actually almost emailed you, but then decided to email the designer and ask if the release date was happening soon and it turns out it was the same day! 😀 Hope you are doing well. Hugs! The dress looks just amazing on you, the fit looks really good and impressed by the size range and that you have needed to make few adjustments, on the legnth I think just below the knee looks very flattering on us curvy girls as I believe it elongates the body, especially if the design is fitted well in a pattern or single colour fabric all the way down… Or maybe that’s just me! Looks like a great design for that period from fall/ autumn to spring especially wearing it as you are with a warm pair of tights and boots. Speaking of fabric you’ve picked another awesome fabric that looks tremendous on you. I hope you have the spoons available to make the pattern again when the designer makes the final version of the pattern available. 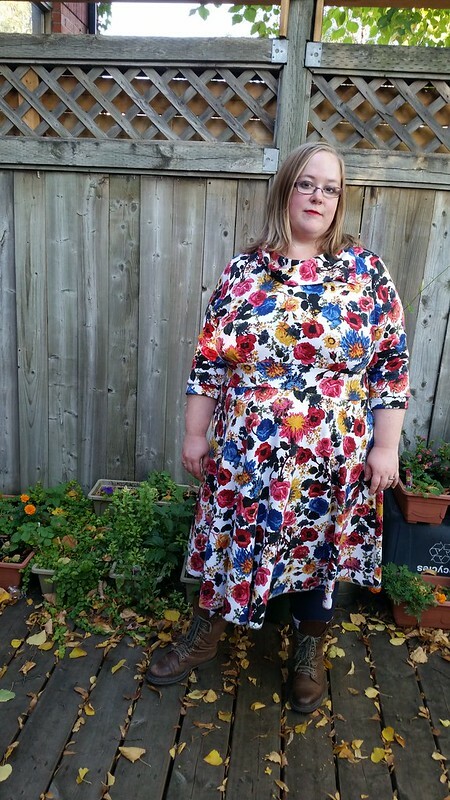 I’m impressed you made the dress in an evening, it does not look like a dress that is a quick or easy make (they normally look a bit like tents like to me) so I’d say that’s a thumbs up for the design and for your serging & sewing skills. On to the spoon life, I hope all is well for you at present. Hope the pacing is paying off and you’re able to have as good a balance of life as you possibly can. I’ve not commented on your recent posts as my help dog had a knee op a couple of weeks ago and my spoons have almost all gone on him… Wouldn’t have it any other way though 🙂 he’s healing well and now my spoons are going on making sure he doesn’t do too much too soon! Spending my days playing doggy brain games and yes, we’re both asleep after so even less creativity than usual but he’s more than worth it! Things are okay…ish…. on the spoon front. The transition of seasons and winter are always difficult on my joints and migraines with the pressure changes, but I seem to be doing better in some ways. My hip isn’t hurting as much as it was in the summer but my shoulder is much much worse. I definitely need to save my spoons for making accessible bras and dresses, because it is getting very tough to move my shoulder without it slipping out of the joint. Big stripey hugs back to you and best wishes from Canada! Your dress looks fabulous! Great fit and I love that collar! Grabby kitty made me laugh so hard! The collar is so cool! And this fabric and the waistband sit so prettily on you. Can you add a strip of fusible interfacing to help the hem flip–I missed it–is this a knit? Grabby Kitty is so me! lol. 😀 Thanks so much, Elizabeth! This hem isn’t flipping with just a serged edge luckily. With other ones, I’ve used knit stay tape when I turn up the hem and it works so well. The other tip I got recently was to put the line of stitches very close to the fold and that has really helped for both woven and knits. Thanks for pointing out the knit miss! I edited the post so that was clear. D’oh! ❤ ❤ You rock! That dress turned out beautifully, and the print is gorgeous.